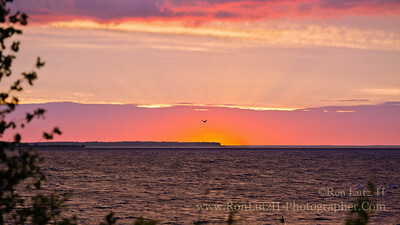 This gallery is of photos taken while we visited Peninsula State Park during the summer of 2014. 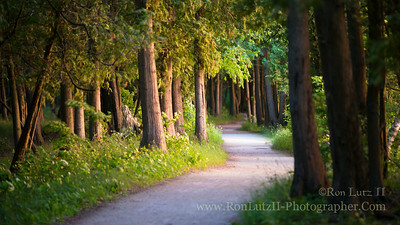 Please check out the page on my site that uses these images to describe our experience. We had a particularly long drive to Peninsula State Park. Our camping gear that was stacked on our roof rack caused the Jeep to rock side to side if we even approached 50mph. This meant we took only smaller county roads, making a three hour drive into a seven hour drive. 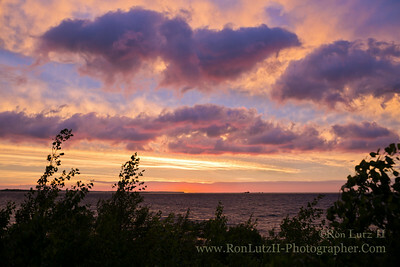 Rolling into the park at sunset along Shore Road we were greeted by a colorful display. We just had to stop at a historical marker and hop out. We felt so relieved and excited to finally arriving, and the simply gorgeous view here made our timing seem perfect. Naturally, Freja was the first one to the water's edge. 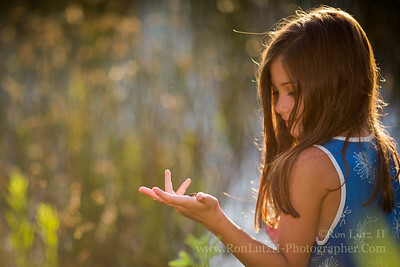 There she discovered a horde of tiny frogs that had just finished changing from tadpoles. It seemed this was all going to be a great trip right from the start. Freja was thrilled to find out we'd packed her bike. We allowed her to ride around the circle of the road near our camp site. Only once did she stray off into the other circles, and then became "lost." When she found her way back 25 minutes later she had a small tear on her cheek, and never strayed far again. 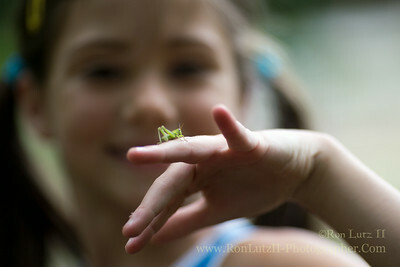 A tiny grasshopper perches on Freja's finger. 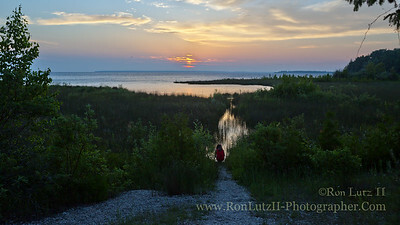 We loved the sunset colored textures of the shoreline along the bay. If it wasn't for the swarms of biting bugs, and thick coating of bug repellent needed to be outdoors, it'd be an ideal place to live. Of course, come winter, I can't imaging how cold it would become. One day we went for a drive just to see what was around the rest of the peninsula. 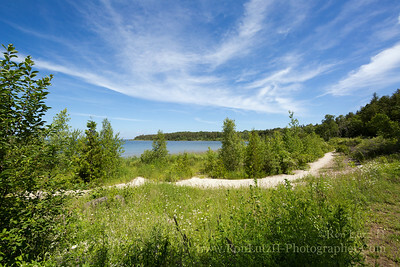 After making a random turn or two we found ourselves at Door Bluff County Park. It's a nice, natural area with few marked trails. 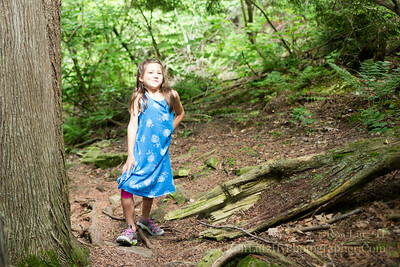 It was perfect for the kid of exploring we enjoy. Freja made a few attempts to stack stones but was more interested in just playing in the water. Stay Out of the Water! After a rainstorm passed I noticed the light beginning to change, becoming brighter. 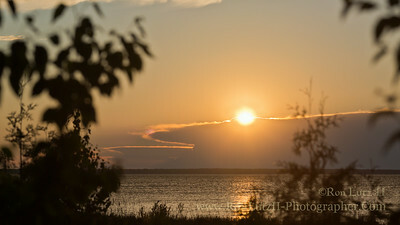 I grabbed my gear and ran to the nearby Tennison Bay. 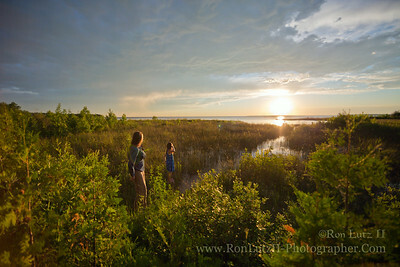 We'd chosen to camp near the western short of Peninsula State Park just in case of sunsets. Needless to say I was very happy we did so. 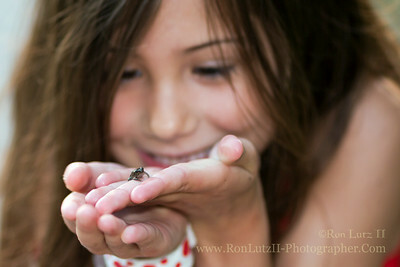 Freja discovered a horde of tiny frogs along the shore at Peninsula State Park. She was fascinated by how small they were. They must have just finished their transformation from tadpoles. 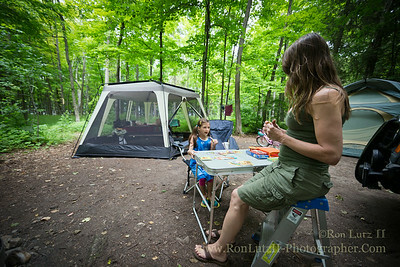 Of all the pieces of camping gear we love the dinning fly the most. It does a great job of keeping out the mosquitoes, and other biting critters. 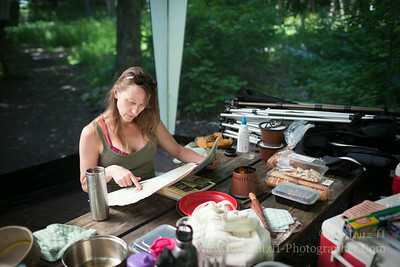 It also becomes our central gathering point for most our time in camp. The folks in the site adjacent to ours had a really nice, well behaved dog. 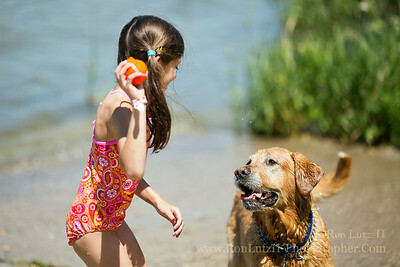 Freja and he became pals, especially when it came time to through his ball in the water. Near our site was the kayak/canoe launch. It also made a perfect spot for a girl and a pooch to play for a while. 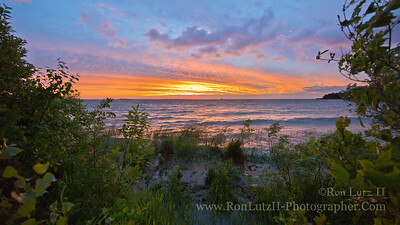 For a second night in row we enjoyed a scenic sunset at Peninsula State Park. 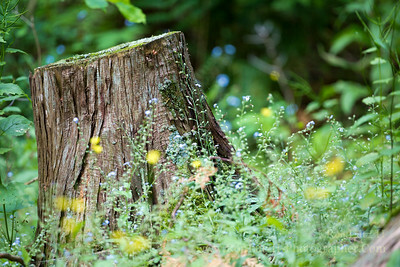 This little stump with flowers caught my eye as I strolled along. After convincing Teri that we weren't going to die fall down the bluffs, we made our way to the shore line. 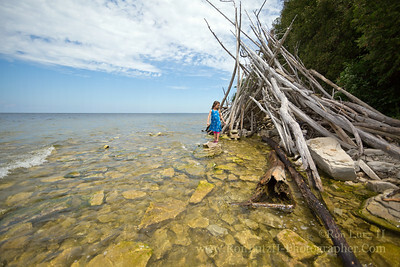 There we found folks had piled driftwood into a pyramid, and stacked stones all along the rocky beach. Naturally, it was impossible to keep the kid out of the water. 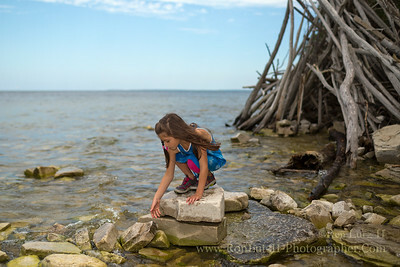 Teri carefully, patiently stacks stones along the shore at Door Bluff County Park. A light rain began to fall at the end of the day, and it seemed there was a chance of a big downpour. 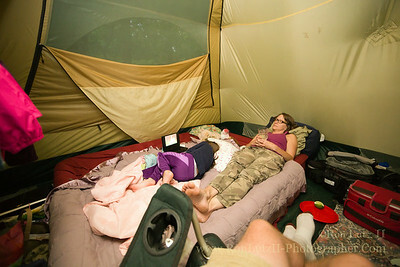 We hunkered down in our tent, Freja with her DVD player, and Teri with a pillow behind her head. I had a comfy chair to relax in while I enjoyed a beer. The rain didn't last long though, and as my family dozed off I noticed the light outside began to change, becoming brighter. 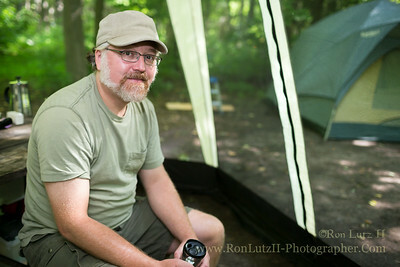 There's nothing like a fresh ground/brewed cup of coffee, made just like at home, while you're camping. 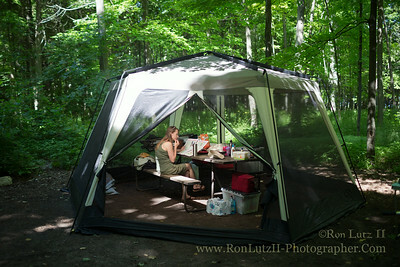 We'd set up in Tennison Bay campground, located on the western side of Peninsula State Park. Thankfully we had our screened in dinning fly to ward off the swarms of insects that inhabit the park. 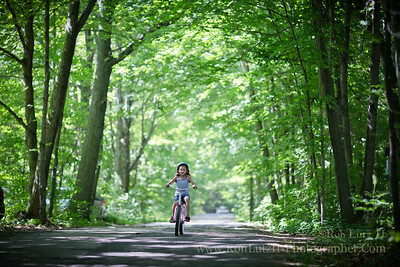 We traveled to Door County with no preplanned activities, choosing to simply "go with the flow." 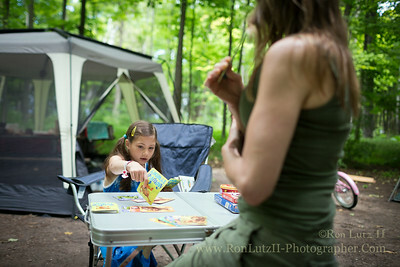 Teri spent a little time looking at the map, and learning what was around us. Not having any sort of real schedule allowed us to simply relax. I can't think of a better was to vacation. 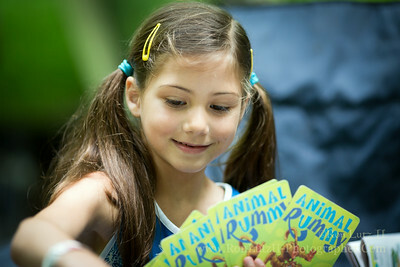 Freja just loves playing games with Animal Rummy being her favorite. On our way back from dinner in town we stopped to enjoy the sunset. Again the kid found lots of tiny frogs. She's catch a few and then release them unhurt. 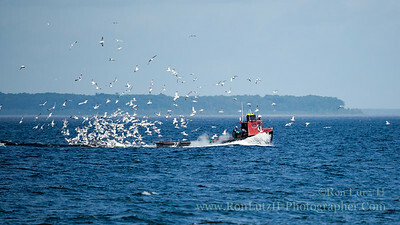 A flock of seagulls swarm a fishing boat heading out into the lake. 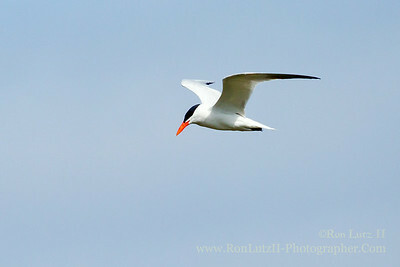 At first they were flying in circles around and around the boat. One of the men then dumped what I assume to have been fish guts off the stern. The ensuing feeding frenzy lasted for some time! The shoreline of Tennison Bay in Peninsula State Park. What appears to be a graveled path is actually the high wave/storm line of the lake. Teri adds stones to the stacks along the shore. It seemed this is a place where people have been doing this for a while. 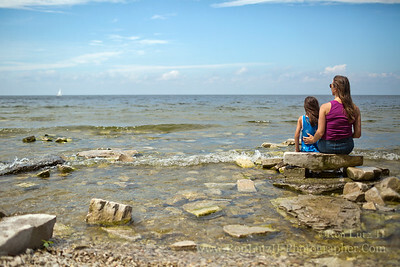 Freja and Teri watch a sailboat slip by on it's way out to Lake Michigan as they sit by the shore of Door Bluff County Park.